KMIII Max static rope is a balanced construction consisting of a continuous filament polyester twill pattern cover over a unidirectional nylon core. KMIII Max is designed to be more abrasion resistent, and to significantly reduce drag. 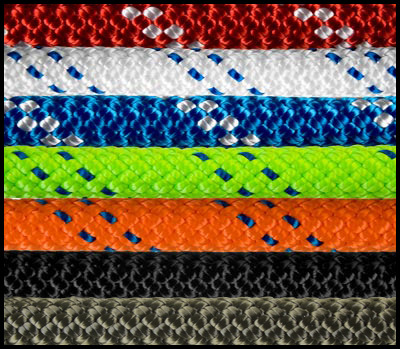 TPT (Twill Pattern Technology) is our 1-over-1 sheath design that results in a lower coefficient of friction significantly reducing drag through protection. Want to know more? Click here. The polyester cover is very flexible, absorbs less water, has lower stretch, and is more abrasion resistant than the nylon covers found on some static ropes. The polyester cover and nylon core are balanced during manufacturing to attain the ultimate in performance. KMIII static rope is a balanced construction consisting of a continuous filament polyester cover braided over a unidirectional nylon core. KMIII is designed to meet the rigorous requirements associated with rescue and rappelling operations. KMIII is dual certified (CE & NFPA). Very little degradation from UV, and can be used over long term if inspected regularly. Polyester has good resistance to most chemicals, except 95% sulfric acid and strong alkalis at boil. Nylon will degrade with strong oxidizing agents, mineral acids, and 90% formic acid. Nylon may discolor when exposed to high levels of carbon dioxide. Polyester has a melting point of 480˚F with progressive strength loss above temperatures of 300˚F. Nylon has a melting point of 460˚F with progressive strengh loss above 300˚F. Good resistance to the passage of electrical current. However, dirt, surface contaminants, water entrapment, and the like can significantly affect dielectric properties. Extreme caution should be exercised any time a rope is in the proximity of live circuits. set at 15 for life lines. Free Freight. Some Restrictions Apply.